Remove 750 yellow gems this week! 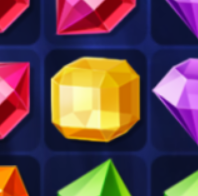 Match 3 or more jewels to remove them. Aim to clear as many yellow ones as you can! Make sure to meet level targets to win a game. Score 105,000 points this week! Find 12 hidden objects in every scene but keep an eye out for the two bonus items for extra points – Map and Camera. Finding items in quick succession gives you Combo Bonus that raises your score. If you get stuck use the Hint button. There are other useful power-ups available for assistance as well. Playing in Full Screen Mode can give you a better view of things and makes finding items easier. Make 11,000 matches this week! Match a number on the reels to a number on the card. Make Slingos to make room for new matches! Red Jokers allow you to match any number in the same column. While Green Jokers can be used to match any number on the card. Click on individual reels while you wait for the SPIN button to recharge. There are various Power-Ups available to give you a helping hand.